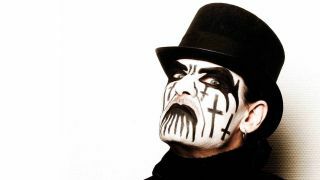 Ever since he made his mark in the early ‘80s with Mercyful Fate, King Diamond has been a massively influential figure on the extreme metal scene. Danish born but now a resident of Texas, his musical and visual approach, both as a member of this band also as a solo performer, has been striking and original. But away from the glare of fame and the expectations of his fans, what drives the real King Diamond? As he prepares to play an eagerly awaited show at The Forum in London on June 21, we get his guide to life. “I listen to a lot of old stuff still. I have a huge number of CDs, and some of these are very rare. I have them on labels which don’t even exist any more. One thing I don’t have, though, is a turntable; I haven’t owned one for years. But I do have some special albums on vinyl. For instance, I have the one album put out by Captain Beyond in 1972, with a 3D sleeve. I also have Physical Graffiti from Led Zeppelin in an original pressing, with the cut-out sleeve, and I have a copy of Zeppelin’s Houses Of The Holy with an embossed sleeve. Then, there’s Sabbath Bloody Sabbath from Black Sabbath with lyrics – and that’s the only way I found out that Rick Wakeman played keyboards on that record! “I listen to new albums put out by people I know, and I still go back to my Uriah Heep albums. Their original singer David Byron is my all time favourite vocalist! “I never talk openly about my political beliefs. I am an entertainer, and don’t believe I should use this position to preach to anyone about who they should be voting for. Others might disagree, but that’s the way I feel. “I am eligible to vote in the upcoming US Presidential election, but I won’t, because there isn’t a candidate who represents what I want. In Denmark, you have 13 or more political parties, so it’s not too difficult to find a party who reflect your views. Coalitions happen all the time, and there’s a decent percentage that will be represented. In America, though, it’s a two party system, and that’s bad because they spend much of the time disagreeing with each other for the sake of casing arguments. If one patty suggests doing something, you know the other will automatically argue against that. So, what chance is there for a reasonable representation? “People still ask me if I am a Satanist. Absolutely, although that depends on how you define Satanism, and one thing I have never done is join any Satanic church. I have my own beliefs. However, as with politics, I don’t tell anyone what they should believe – I don’t preach. Everyone has to come to their own conclusion which god they want to believe in – if they believe there is a god at all. “I am a huge football fan – or soccer as they call it in the States. I watch matches all the time on TV, from the various European leagues, but my favourite is the English Premier League. I love the way this season has been so unpredictable. I don’t follow one particular club, though. I’m not biased, but can sit and enjoy the drama and spectacle as a lover of the sport. “In my early teens, I was considered a good player. I played for a Danish club called Hvidovre IF, who were a first division side at the time. I was part of their youth squad when I was 13, 14, 15, and was even voted the player of the year, but then I began studying at college, got into music and playing football faded. But I still have a big passion for it. “I had triple bypass heart surgery in 2010, and since then I have become a lot healthier. I gave up smoking after my heart scare, my wife keeps me on a strict diet that I follow completely, and doctors are amazed at how healthy I am these days. Honestly, I think I am now healthier than I have ever been. “I love to take every opportunity to talk to fans; they are the reason I do this. One thing I enjoy is doing meet and greets, but unlike so many other bands, we do it properly. I went to one big band’s meet and greet recently – I shan’t name and shame them – but before they met us, we were all given a strict list of rules we had to adhere to, such as only having one photo taken with them, only having one thing signed, and only being able to spent a few seconds in their company. And if anyone dared to overstep the mark and ‘break’ any of these rules, they would be immediately removed. It was ridiculous, and not the way to treat fans. King Diamond: "My Apartment Was Haunted - Ask The Guys From Metallica"